Nausea stinks. Feeling completely weak and tired with no energy is tough. Experiencing random pains throughout the day isn't pleasant. But, for me, these aren't the worst parts of undergoing therapy. You see, chemotherapy kills bad cells, but it also kills the good cells. The hope with chemotherapy is that it kills those bad, rogue cancer cells before killing too many of your healthy cells. This means that your good blood cells often suffer in the ongoing battle. Those that are involved in keeping you protected from bacteria, viruses and other illnesses are also harmed. 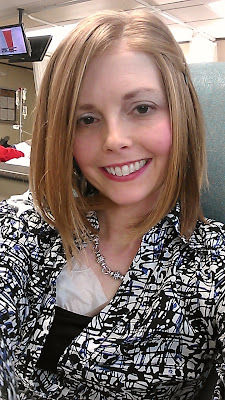 My white blood cells have been taking a beating during chemo. If I were to acquire an illness, even the common cold, while my immune system is suffering, it would be difficult for me to fight it. This would mean hospitalization, a delay in treatment and even worse things, which I will not mention right now. Because of this, our family has to be extra careful in being exposed to germs (bacteria, viruses, etc. ), so that none of us carry these things or become ill. If someone in our immediate family becomes ill, it is likely that I will also. The act of trying to protect ourselves from these illnesses during flu/cold season is difficult. It is the thing I dislike most about undergoing chemotherapy. It means we cannot attend church. There are too many people in a confined space there. Plus, if we put Abbey and Luke in the kids' church and nursery, that would mean exposure to other children who could potentially be sick. At least at Luke's school there are rules regarding when you need to keep your children home due to illness. But, we have decided many times not to even send him to school due to potential exposure. I miss attending church SO MUCH! I am really looking forward to getting through chemotherapy so that we can attend as a family once again. Having a severely weakened immune system means that we cannot go shopping at the indoor mall. It's Christmas time. Honestly, I don't usually do my shopping at the mall anyway, but it is nice to walk around the mall during Christmas time. Also, the mall gives parents a great escape from the house in the winter months. When it is too cold to play outside or weather prevents it, at least you can take the kids to the mall to run around. They have a great indoor play area for little ones at our nearby mall. It means no more Chick-fil-a or other fast food restaurant indoor play area. Again--these places were my go-to when I needed to let Luke run around and it was cold outside. But, these indoor play areas are probably the worst place I could take him as far as germs are concerned. Since they are indoors and are played on by many children (who may or may not be sick), they are germ havens. My doctor wasn't very specific on places to avoid when she first gave me instructions on restrictions during chemo. But, this is one place my doctor told me to never go or take my kids. We have to be very careful who we hang around in close quarters. If someone is sick or lives with someone who is sick, we can't hang out. During this flu and cold season, this severely limits who you can have over. Also, this may make Christmas celebrations with our extended family a little different this year. No trips to the grocery store for me. This was my weekly get-away prior to chemo. No Holiday Parties for us. We had to miss our church Community Group Christmas party that was held last night. We actually have hosted this party since 2008, when it first began for our community group. It is a wonderful time of gathering for all of us and we have an annual white elephant gift exchange (this is always hilarious). Not only could we not host the party this year, but we also could not even attend. There would just be too many people in a confined space and our kids were bound to touch everything and everyone there. This was so hard for us since we consider this wonderful group of people our local Family. Well, our community group surprised us last night! They all came to our door after the party and caroled. Not only that, but they also brought over a couple of white elephant gifts for us and just hung out a while to chat. These folks are amazing people! We love and miss them so much and are so thankful to have them in our lives. They warmed our hearts so much last night! Thank you all! I am someone who likes to constantly be on the move, giving my children lots of fun experiences. So, this is so tough for me. I feel a lot like a hermit and I feel badly that my family has to feel this way also due to my treatment. Having a weakened immune system really affects your life in many ways, but the above list are just some of the ways it is affecting us this Christmas season. I am writing this from my chemo chair right now. Although I had my weekly Taxol treatment last Tuesday, due to it being delayed by a day (from a low ANC and WBC), I am here on a Monday trying to get back on schedule. I felt awful last week. I experienced new bone/muscle pains, had some cold symptoms and had absolutely no energy on Wednesday-Friday. On Saturday, I started to feel slightly better. On Sunday, I felt like I had slightly more energy than Saturday. But Wednesday-Friday I pretty much just wanted to sleep all day and do nothing. I didn't get to rest because my responsibility is to take care of our children, but I really wanted to. Don't get me wrong, my children are such a joy to be around and are actually in many ways therapeutic. But, I could barely move. So, I knew trying to get back on schedule would be very tough. My CBC numbers just came back. My ANC is only .3 (needs to be 1.5 in order for me to be able to get my treatment) and my WBC is critically low as well. So, I will receive a Neupogen shot, which will hopefully boost my immune system. I will pray for a rise in my immune system counts so that I can get my weekly Taxol treatment tomorrow. Thank you for your prayers! 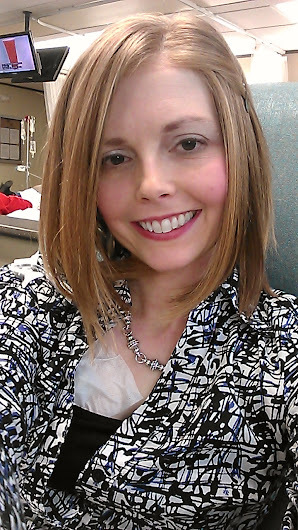 And...the weekly cheesy chemo chair photo. I'm so glad the group came over for a surprise. What a treat!